Omega Glaze poets geeft een prachtige nat lijkende glans aan u lak. Verwijderd kringen en fine krassen uit uw lak zonder schurende werking. geschikt voor alle laksystemen. Voor optimaal resultaat werk de finish af met One Grand 'Blitz Wax". 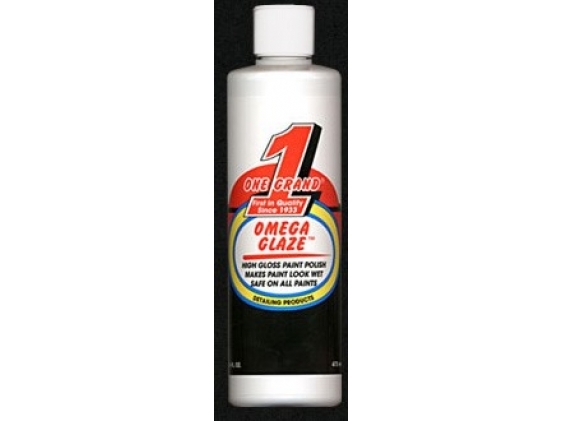 "Omega Glaze" is a high gloss paint polish that we designed to be used by hand or machine to prepare a finish for applications of "Blitz Wax". "Omega Glaze" polishes a surface to that creamy, clear, wet looking appearance, giving the finish a deep, highly reflective luster. The surface also feels very smooth and slippery to the touch, creating the perfect condition for applying "Blitz Wax". "Omega Glaze" performs beautifully on all colors & paint finishes and its' quality and attributes are most noticeable on dark colors. We often hear people comment on "Omega Glaze" making colors look richer… Black is Blacker, Red is Redder, Metallics look like their pearls and flakes are dancing & shimmering in the surface! "Omega Glaze" is safe on all finishes, and is the trusted, go-to product for professionals when they have to make a vehicle look stunning. When you follow "Omega Glaze" with a coat of "Blitz Wax" it takes the finish up a notch in gloss & clarity, while adding amazing depth & protection.